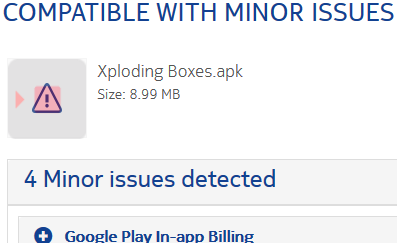 A run through the compatibility checker confirmed my fears. Of the five android apps I am currently selling through Google Play, only one had no compatibility issues. Most of the problems with the apps centered around support for in-app billing (there are also issues with supporting any mapping APIs). While the tool regards this as a minor issue, the ability to make money from apps is kind of important (and due to my use of the AIR framework also tricky to fix). The billing API is mostly a drop-in replacement for Google’s, but I feel that it would be easier if Nokia took a page from BlackBerry’s book and allowed the apps to integrate with its store without any code changes at all. Amazon does a similar thing to Nokia in forcing developers to rework their apps, but in exchange at least promises a unique and sizable market. Meanwhile, Nokia’s X phones live under the threat of being axed by Microsoft before we even reach summer.